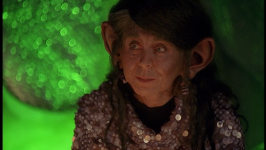 - Chiana's disguise doesn't seem like it should have been terribly effective. It's basically just different hair and clothes. Noranti's wasn't much better. Plus it seemed to work in a completely arbitrary fashion. Some people recognized them and were all like, "Hey why do you look different?" Others (like Braca) were completely fooled. And there was no rhyme or reason to any of that. The whole thing was seriously lazy in its execution. - Why were the translator microbes unable to translate the Scarran language? And if the translator microbes cannot translate the Scarran language, why are the Scarrans able to communicate routinely with other species? Do the Scarrans speak two languages? One which is translatable by the microbes and one which is not? - Noranti seems immune to poisons. - Grayza has been conditioned to resist the Scarran heat mind probing. Grayza also indicated that, at the very least, everyone else in her entourage had been conditioned with this training as well. - War Minister Ahkna's father used to rule the Scarrans, but he was deposed. - Francesca Buller, the wife of lead actor Ben Browder (who plays John Crichton) plays War Minister Ahkna in this episode. This is her fourth role in the series. She previously played M'Lee from Bone To Be Wild, ro-NA from Look at the Princess, and Raxil from Scratch 'n' Sniff. 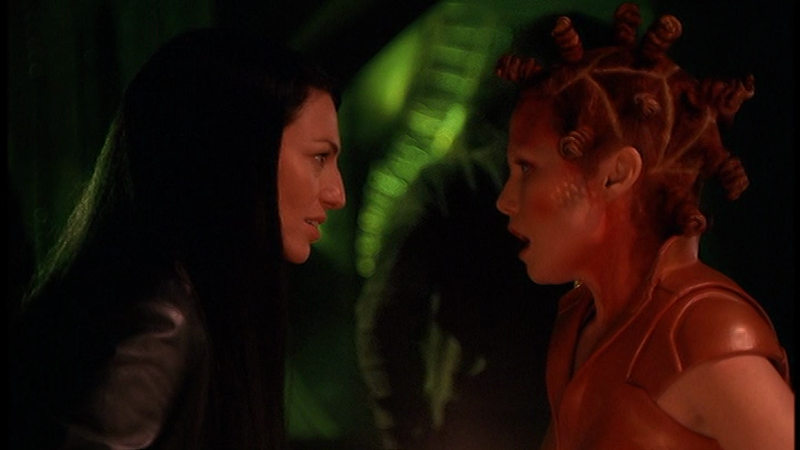 Buller has stated that she based her performance for this role on Alice Krige's performance as the Borg Queen in Star Trek VIII: First Contact and Cate Blanchett's performance as Queen Elizabeth I in the film Elizabeth. - Noranti determining that the free drinks were actually a drug cocktail and warning the others not to drink it. - Peacekeepers and Scarrans arriving at the trading outpost. - Grayza offering War Minister Ahkna the Luxan territories in exchange for peace. 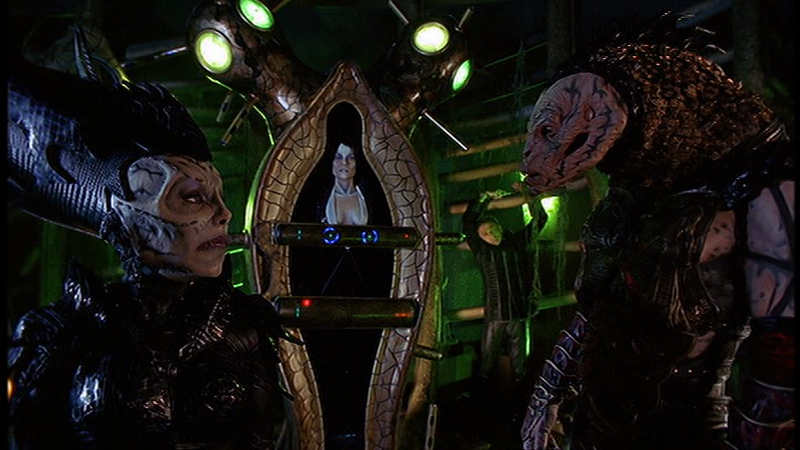 - Ahkna betraying Grayza, capturing her and Braca, and taking them away to be interrogated. - Noranti drugging the Charrid and making him turn on his comrade. - Chiana being mistaken for a transport pod thief because of her disguise. - John figuring out Aeryn is an impostor. This skillfully written episode is a much better executed counterpoint to the previous episode. The girls go on a quest to procure an equally mundane objective as the guys were tasked with in the last episode, but in the process the girls are swept into some epic developments with regards to the political machinations of the Peacekeepers and the Scarrans and the cliffhanger surrounding Aeryn's capture by the Scarrans seals the deal. Along the way there are a number of nice touches. Having just the girls as the primary protagonists of the story is an unusual choice and leads to some interesting character dynamics. Of particular note is the disproportionately important roles that Sikozu and Noranti played in the episode, which was a nice change of pace. I especially enjoyed Noranti detecting that the free drinks were poison. This nice touch of a scene is a fantastic parallel to a similar scene in Star Trek DS9's episode Ties of Blood and Water in which Weyoun similarly identifies poison by drinking it and then exhibiting immunity. 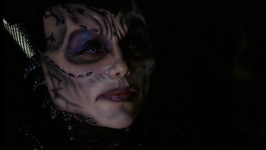 Continuing the trend of well executed female characters, Grayza of course makes a prominent appearance in this episode acting opposite to the awesome new villain: War Minister Ahkna. This Ahkna is the best offering from the Scarrans yet, as she adds a great deal of texture and subtlety to their interactions. Ahkna is not the blunt instrument that her minions and lackeys are. She truly is Grayza's Scarran counterpart in every way. I greatly enjoyed that she saw fit to reference the recent destruction of one of their dreadnoughts and that she was keen enough to suggest that it may have been a lucky shot with an experimental weapon or possibly not even a Peacekeeper achievement at all. The whole series of negotiations was indeed a lot of fun. Ahkna played Grayza like a fiddle. Overall while this episode is mostly setup for what's likely to be cooler stuff to come later it manages to stand well on its own as quite an entertaining piece.